Members of the Texas House of Representatives held a press conference today to announce the House plan to fund public education and the TRS. House Speaker Dennis Bonnen (R – Angleton) who was surrounded by a majority of the members of the House from both parties introduced the plan and threw his leadership weight behind the legislation. The plan includes HB 3 related to school finance by Dan Huberty (R-Kingswood) who serves as chair of the public education committee and HB 9 by Greg Bonnen (R-Friendswood) who serves as chair of the appropriations subcommittee that handles education and TRS funding. Huberty described his bill, HB 3, as a comprehensive plan including over 9 billion dollars to reform the school finance and education system and reduce school property taxes. Bonnen’s bill, HB 9, proposes to make the TRS pension fund actuarially sound and provide a 13thcheck (not to exceed $2,400) to retired educators. Together these bills seek to provide support to every Texas school and the students they serve and recognize and support public educators from recruitment to retirement. Both Huberty and Bonnen stressed the urgency of taking action on these issues during this session. HB 9 would make the pension fund actuarially sound by raising the state contribution to TRS to 8.8 percent over time as well as provide a one-time payment to retired teachers. The current state contribution rate is 6.8 percent, and is the lowest in the nation among non-mandatory Social Security states. The next step for HB 9 is to receive a committee hearing. Yesterday, Sen. Joan Huffman (R – Houston) filed, SB 12, which would make the TRS fund actuarially sound and provide a one-time supplemental payment (capped at $500) to retirees. Lt. Gov. Dan Patrick issued a press release about SB 12, which you may read here. The actions in the Senate and House are great first steps to reaching TRTA’s legislative priorities this session and demonstrate that both houses of the Legislature are willing to work with TRTA to make positive progress for retired educators. Both the Senate and the House are talking about real funding solutions for TRS and raising the base. However, these bills are not a done deal, and they have a lot of room for development. The development is going to include retiree input. It’s up to us to support and communicate with legislators. TRTA members, your legislators are listening! The march is on to make headway on bills relating to your retirement! We want to see the Texas Legislature #RAISETHEBASE to improve the health of the TRS pension fund and TRS-Care fund. TRTA Hosting Day at the Capitol Event on April 3! 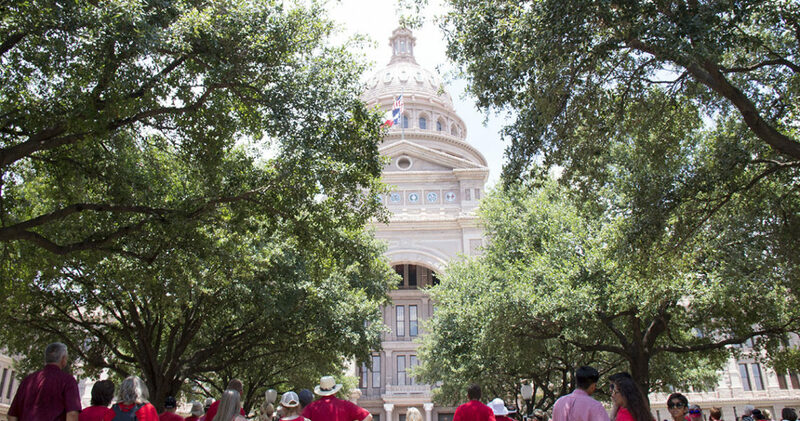 The Texas Retired Teachers Association (TRTA) will host its biennial Day at the Capitol event on Wednesday, April 3 in conjunction with the 66th Annual TRTA Convention in Austin. 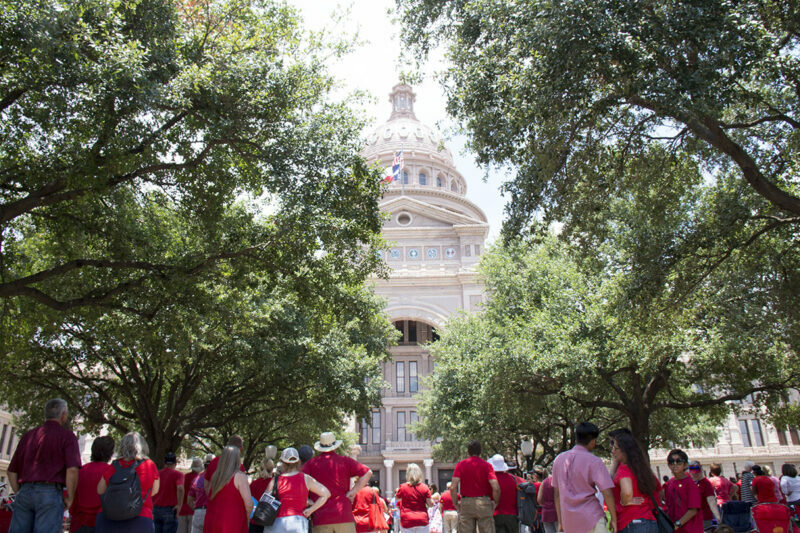 In years past, thousands of Texas public education retirees have filled the halls of the Capitol wearing red shirts and promoting the preservation of the TRS defined benefit plan and TRS-Care! TRTA is expecting just as many retirees, if not more, to arrive this year on the east lawn of the Capitol grounds wearing special bracelets that read “RAISETHEBASE!” for a day filled with legislator visits, House and Senate honors, and an old-fashioned ice cream social! We are asking all attendees to wear a red shirt to show solidarity and impress legislators with the “Sea of Red” when TRTA members fill the hallways! Be sure to wear comfortable walking shoes. Advocacy materials, snacks and water will be provided for all attendees. If you’re attending convention, bring your convention bag and name badge with you. If you are not attending convention, please consider bringing a bag from home. A limited number of bags will be provided for out-of-town visitors on a first-come, first-served basis. Bring business cards if you plan to meet with legislators or staffers. Carry your identification and any pertinent medical information you may need in case of an emergency. Convention attendees may ride a shuttle from the Hilton to the Capitol. Shuttles will begin running in 20-minute intervals at approximately 7:00 a.m. and will run continuously until 4:00 p.m. (final pickup). If you are travelling to Austin on April 3 or prefer to park near the Capitol you may do so in one of the state parking garages located along San Jacinto Street (between 12th, 13thand 14thstreets). From the state garages, the east lawn is a short walk of one block to the west. If you are with a large group arriving on April 3, please be aware that buses must unload passengers on the east side of the Texas Capitol (on Brazos street). Buses may park along Trinity Street. RSVPs Needed from Non-Convention Attendees! If your district or local unit plans to bring a large group to the Day at the Capitol but is not attending the convention, let us know! Send an email to info@trta.org (Subject Line: Capitol RSVP). This will help ensure that plenty of materials, snacks and water are available for everyone. Due to the long lines that may form at the east door, members who are willing and able should utilize alternate entrances (north, south and west). The only wheelchair accessible ramp is located at the north entrance. All entrances require visitors to pass through metal detectors and have a bag search. A quick entry line is available for persons who have a concealed handgun license. At approximately 9:30 a.m., retirees will be honored with a resolution in the House gallery on the third floor. Since there are several other groups visiting the Capitol that day, we recommend that you arrive in the gallery by 9:00 a.m. to find a seat. If the gallery is full, a short walk across the hallway to the Senate gallery will give members the opportunity to hear a similar resolution by the Senate at 10:30 a.m.
By 11:30 a.m. or 12:00 p.m., members may begin gathering on the east lawn for a rally and ice cream social. Vanilla, chocolate and strawberry ice cream will be provided by local Austin favorite Amy’s Ice Cream. Be sure to invite your legislators and their staffers to join you! Day at the Capitol allows plenty of time for you to visit with your legislators. To set an appointment, call the Legislator Hotline (888.674.3788) and speak with the scheduler in your Senator’s or Representative’s office. If you want to attend either the House or Senate resolutions honoring retirees, schedule appointments in the early morning or in the afternoon after the ice cream social. Plan for at least 20 minutes between appointments as the Capitol is quite large and there are long lines to use elevators. TRTA will not provide lunch during the Day at the Capitol event; however, the Capitol Grill (located on floor E1) offers a wide variety of delicious and quick food and beverage options. Please note that many legislative staffers at the Capitol will take your photo with your Senator or Representative and email it to you. You can also ask a legislative staffer if they mind taking a photo using your personal cell phone! Email your photos to info@trta.org and we will post them to Facebook. If you want to stay the night in Austin, TRTA recommends the Drury Inn located at 6711 N. IH 35. TRTA members receive 5 percent discount off Drury’scorporate rates. Contact the Drury at 1.800.378.7946 and provide Corporate ID #311435 or visit www.druryhotels.com (use BizTrip Corporate ID #311435). TRTA is the voice for public education retirees, and we want to be seen and heard on April 3! Let’s get as many TRTA members and friends as possible in Austin for this important legislative event! Let your legislators know we are looking forward to seeing them on April 3! Call 888.674.3788 to reach out to your legislators now. Stay tuned in the coming weeks for a special email campaign. Click here to download a press release about convention and Day at the Capitol that you may send to your local media outlets! Thank you for your membership in the Texas Retired Teachers Association (TRTA). If you are not a member of TRTA and want information about joining, please contact us at 1.800.880.1650. Follow us on Facebook! 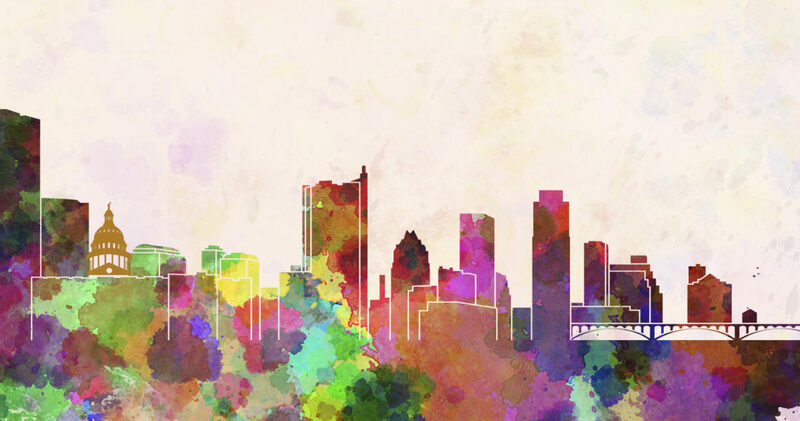 Registration for the 66th Annual TRTA Convention to be held in Austin, Texas April 1–2, 2019 closes this coming Friday, March 1! This year’s theme is Connecting the Dots to TRTA’s Success, a meaningful metaphor that matches TRTA’s legislative goals as we head into another challenging session in the Texas capital city! The convention will be held at the Austin Hilton on 500 E. 4th Street. TRTA members can register online by clicking here. There is no better time to be in Austin! The Texas Legislature will be in regular session, discussing such vital issues as the TRS–Care health insurance program and ways to protect the longevity of benefits for our public education retirees and pre–retirees. More than 1,000 TRTA members are expected to come to Austin to receive training, hear from legislators, and receive a comprehensive legislative session update. This year’s sessions include “Making a Digital Memory Book,” “Benefits of Owning a Pet,” “The Texas Silver Haired Legislature,” officer and committee training sessions, and more! Members will convene for a Pep Rally on the afternoon of April 2 to prepare for the April 3 TRTA Day at the Capitol event and learn how TRTA wants the Legislature to #RaisetheBase. A complete schedule of events is listed here. A full update about TRTA Day at the Capitol will be emailed out later this week. Don’t forget to submit your convention registration by this Friday, March 1! REGISTER NOW! We look forward to seeing you in Austin on April 1.